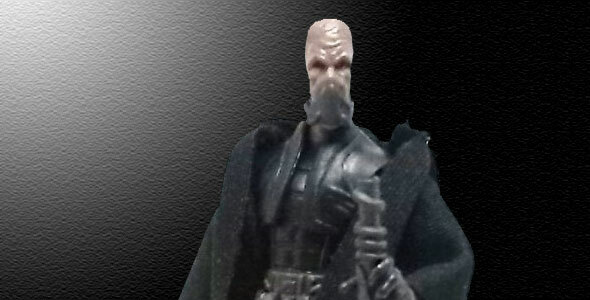 Darth Plagueis is one of the few remaining dark lords in the Star Wars mythos, and he had an action figure release in the 1/18 scale segment of the Star Wars Black Series. I never quite got Quinlan Vos. He seems derivative of so many other characters from the Star Wars Expanded Universe, but that doesn’t seem to prevent him from being made into action figures over and over. The Star Wars Expanded Universe can be so many things for different people. For some, it is a valid continuation of the exploits of their heroes outside the frame of the movies; while others think it’s just thinly veiled attempt to keep milking the same intellectual property. The Star Wars Expanded Universe is a rather bizarre beast. Over the years there have been numerous books, comics and videogames that explore the often-unseen events that take place in the lapses of times punctuated by the films. The sheer volume of information is simply way too cumbersome for me to bother trying to catch up, although there is one segment of the Expanded Universe I feel comfortable with, and that is video games. Even though the Hasbro 2-figure Comic Packs are no longer in production, the general consensus was that these were pretty good value for the money, by including two action figures and a reprint of a comic book. I have mixed feelings about the Star Wars Expanded Universe. Other than the videogames I have personally played, I consider most of it to be little more than professionally written fan-fiction and thus, easy to dismiss.